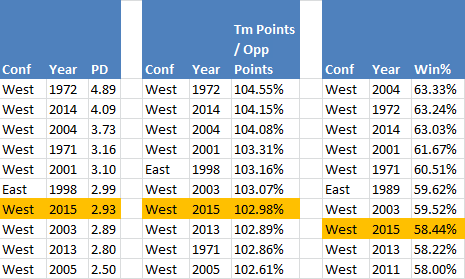 The 2015 West moved down a bit since my last look at those last few statistics, fitting right in with a typical season since 2000, as mentioned earlier. Right now, there’s too much left to be decided before taking a stab at what 2016 will look like. We have the playoffs to play out, which seems to lead to one injury that’ll decide a team’s fate. Then there’s the lottery to determine the draft order, which we know from the past can really move the needle. (Think Tim Duncan and a coin flip between which conference he’d wind up in.) And then the draft, free agency, and so on. THERE’S A LOT OF TIME LEFT BEFORE NEXT SEASON, but it should be fun to see if the East gets a boost over the next six months. So that’s it for this year’s non-conference updates, but if there’s something I missed or you’re curious about feel free to leave a comment on here or over Twitter (my tweets should be on the right side of this blog). I also plan to post some other silly season-ending stuff before the playoffs start, but until then enjoy the break between now and the postseason!